NASA has selected Made in Space for three small business awards aimed at manufacturing high precision metal components, industrial crystals, and advanced sensors and actuators in space. The selections include a pair of Small Business Innovation Research (SBIR) Phase I awards and a Small Business Technology Transfer (STTR) Phase 1 award for a maximum of $125,000 apiece. The SBIR contracts will last for six months while the STTR contract will last for 12 months. Structural-Health Aware Failure-Tolerant Engineered to Respond (SAFER) Additively Manufactured Systems (STTR with The Ohio State University). The Vulcan Advanced Hybrid Manufacturing System (VULCAN) system would allow International Space Station (ISS) astronauts to 3D print high-strength, high-precision metallic and non-metallic replacement parts “with comparable quality to commercially-available, terrestrial machined parts…. The Industrial Crystal Facility (ICF) would focus on microgravity development and producing of “nonlinear optical single crystals and other relatively large material formulations…. The company’s STTR proposal involves collaboration with The Ohio State University on a suite of sensors and actuators designed to monitor the long term health of space vehicles and habitats. “The SAFER Additive Manufactured [AM} System will include a suite of AM solutions for the following applications: embedded strain-sensors for health monitoring and diagnosis; piezoelectric actuators and sensors for system prognosis; and embedded heaters and actuators for system self-healing and increased rigidity,” the proposal states. Summaries of the three selected proposals follow. Made In Space is developing the The Vulcan Advanced Hybrid Manufacturing System (VULCAN) to address NASA’s requirement to produce high-strength, high-precision components on-orbit with comparable quality to commercially-available, terrestrial machined parts. Such capability enables the in-situ manufacturing of critical parts for human spaceflight and without dependence on terrestrial resupply. Made In Space integrates flight-proven microgravity process controls and payload support systems, such as environmental and master controls, with a modular manufacturing & tool system that generates a near net shape for surface finishing or other industrial processing into the final product. One of the key innovations of Made In Space’s VULCAN is the ability to produce finished metal parts with one device, eliminating the need for separate additive manufacturing and subtractive machining facilities. The wire feed architecture of both the thermoplastic extruder and metal manufacturing head allows the hardware to be interchangeable and supported on the same gantry without requiring modification of any of the components. The two manufacturing heads follow the SBM-Spec interface standards for “plug-and-play” operation. Thus, the manufacturing heads can be exchanged easily by crewmembers with no formal manufacturing training. Using this capability, the VULCAN device produces both non-metallic and metallic replacement parts with a minimum of crew interaction. VULCAN is scalable and supports the open SBM-Spec architecture for the thermoplastic and metal manufacturing heads, resulting in a manufacturing methodology that uses multiple materials and can be upgraded over time. The VULCAN technology is primarily intended for sustaining human spaceflight operations, first on the ISS and, later, on long-duration missions to the Moon, Mars, or other destinations in the Solar System. Made In Space has built industry alliances with such companies as Boeing, Lockheed Martin, Orbital ATK, Sierra Nevada Corporation, and Bigelow Aerospace to evaluate the optimal concept of operations for in-space manufacturing as an enabling technology for the NextSTEP Cislunar Habitat. Made In Space is also working with UTC Aerospace Systems and Paragon to develop ECLSS design principles for repair and replenishment by in-space manufacturing. Robotic expeditionary missions can also employ the VULCAN technology for autonomous repairs while building the infrastructure preceding human habitation. Local robots may retrieve and install VULCAN-generated parts automatically or via teleoperation. Such capability may be necessary to ensure continuity of operations without direct human intervention and enable human crews to focus on mission objectives. The Department of Defense has a demonstrated need for advanced manufacturing capabilities in locations and on forward-deployed platforms without regular logistical support or available resources for traditional fabrication and finishing technologies. Perhaps the foremost example is the US Navy submarine fleet. While aircraft carriers are commonly referred to as “cities at sea” because of their size and on-board industrial capacity, the nation’s attack and ballistic missile submarines deploy for months at a time and must function as entirely self-contained units with no physical connection to the outside world. Submarines on patrol duty may only surface during departure from base and upon return. A tactical version of the VULCAN device gives the DoD a modular, common manufacturing system deployable on mobile platforms, such as submarines, destroyers, transport aircraft, and trucks, and in fixed locations with limited external support, such as Forward Operating Bases and advance airfields.Incumbent 3D printing companies generate revenue from four primary sources: new device sales; feedstock sales; on demand printing; and maintenance services. Made In Space plans to adopt a similar revenue model when developing VULCAN units for commercial use. VULCAN units will be developed and sold to the merchant vessel market. Due to its size and importance, Made In Space will initially target the oil tanker vertical. Made In Space, Inc. (MIS) proposes the development of an Industrial Crystal Facility (ICF) for microgravity product manufacturing and applied research. The ICF is focused on advanced materials engineering, rather than biomedical research, and serves a complimentary role to existing NASA-developed hardware, expanding utilization of ISS. Intended applications include nonlinear optical single crystals and other relatively large material formulations. This is a critical next step in the development of Low Earth Orbit as an economic development zone, using the ISS National Lab as a proving ground and following the forthcoming Made In Space Fiber (MIS Fiber) demonstration of manufacturing a product in space with economically-significant intrinsic value on the ground. The ISS National Lab serves as an ideal platform to explore whether industrial crystals can be grown in microgravity to larger sizes and/or improved quality as compared with terrestrial sources. Existing low temperature solution growth methods take days to weeks to complete, so parabolic flights and suborbital vehicles are not suitable for establishing process baselines and making effective comparisons. Microgravity production holds the potential for room-temperature production of NLO materials for high-energy applications with size and quality undiminished by the effects of sedimentation and convection. A new facility is needed to explore the feasibility of microgravity-enabled industrial crystals as a new product market for Low Earth Orbit. The proliferation of photonic sensors and optoelectronic devices for both military and civil applications has no end in sight. From the warfighter on deployment to the commanding officers in the Pentagon, the Department of Defense wants more eyes on the battlefield. Operational needs range from troop-level LIDAR devices to optical and infrared sensors that feed tactical battlefield management systems to early-warning and detection of missile threats from space. Defense researchers are increasingly studying optical computing and other integrated photonic devices to reduce the vulnerability of traditional military electronic devices to jamming and electronic attack. In the civil sector, including NASA, photonic device applications include laser rangefinding, photonic gyroscopes, spectroscopy, and optical communications. For example, the upcoming Laser Communications Relay Demonstration on the ISS, called ILLUMA, relies on a first-of-its-kind integrated photonics circuit to transmit and encode data at orders of magnitude higher rates than traditional digital systems. Future integrated photonics circuits can be lithographically printed on large single optical crystals, much as integrated microelectronic circuits are lithographically printed on semiconductor crystals today. Demand for optical sensors, laser equipment, and optical switches for computing and communications continues to grow. Nonlinear optical materials alone represent a market of more than $1 billion in the optoelectronics sector. Semiorganic NLO materials are being investigated for fiber optic communications components, laser transmitters, computer memory devices, improved LIDAR, ultrafast optical switches, optical waveguides, and image sensors for automotive-safety systems, medical equipment, video security and surveillance networks, human-recognition user interfaces, and other embedded image collection devices. Technical adviser Dr. Gregory Wurtz assesses that the benign production environment and flexibility in designing their nonlinear optical properties lends microgravity-enabled optical crystals towards applications in deep UV lasers for medical devices and the development of thin film materials for active nanoscale devices that are not currently easily fabricated. Structural degradation and failure can cause malfunctions and long-term problems aboard spacecraft, jeopardizing the crew, especially in deep space missions. On Off-world habitats, this can lead to extensive maintenance procedures and dangerous EVAs to fix malfunctions. Micrometeorite impact and shielding breaches can have lasting impacts that pose a significant hazard to the longevity of missions. Made In Space, Inc. (MIS) has been developing novel additive manufacturing (AM) technologies for the production and application of embedded sensors and actuators. MIS’s Structural-Health Aware Failure-Tolerant Engineered to Respond (SAFER) Additively Manufactured System is a suite of integrated technologies and composite materials that are compatible with AM processing techniques ranging from Free-Form-Fabrication, Direct-Write, and injection molding. Using the advanced AM technologies developed for microgravity manufacturing at MIS and piezoelectric thermoplastics provided by the Ohio State University (OSU), a major suite of structural monitoring and sensing technologies will be made available to designers for a variety of applications. The SAFER Additive Manufactured System will include a suite of AM solutions for the following applications: embedded strain-sensors for health monitoring and diagnosis; piezoelectric actuators and sensors for system prognosis; and embedded heaters and actuators for system self-healing and increased rigidity. SAFER embedded systems empower designers to cut weight of structural monitoring and increase structural safety with the freedom of AM. With the development of a novel piezoelectric AM material, SAFER will be a key component to safe long-duration manned space flight such as NASA’s Journey to Mars and beyond. 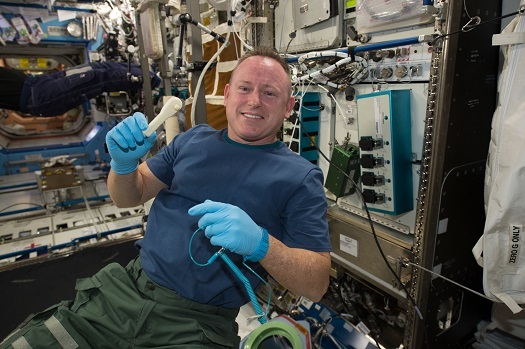 SAFER gives NASA peace of mind by coupling health-monitoring and self-repairing materials. Active support structures for imaging telescopes – Piezoelectric solenoids enable active optical systems. As part of Phase I, 3D printable piezoelectrics are developed, thereby enabling optimized construction of active optical backplanes. Resilient backbone structures for long duration human spaceflight missions. Active monitoring and repair/reinforcement of space launch vehicle structure, enabling portions of the structure to be reinforced if weakened, thereby increasing mission resilience. Vehicles having integrated structural health monitoring and repair/reinforcement, including planes, boats, small submarines such as the SEAL Delivery Vehicle. Actively monitored and reinforced pressure vessels and containment vessels. 3D printable piezoelectric material enables piezoelectric microphones, speakers, inkjet printer pumps, motors sensors, fuses, strain gauges, and the like. SAFER cars – SAFER can be integrated into future vehicles to provide an even greater level of systems monitoring than currently exists in motor vehicles. The addition of SAFER’s repair/reinforcement abilities is functionality that currently does not exist in the market. This is an exciting time. I can not wait for the results of these tests.